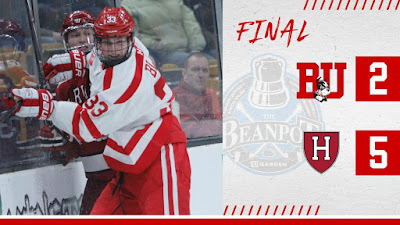 Terriers fell to #18/15 Harvard in the Beanpot consolation game, 5-2, and finished fourth for the first time since 2014. The Crimson dominated the first two periods rolling up a 32-11 shot advantage. Freshman goalie Vinnie Purpura, making his second start, stopped all 2 shots in a scoreless first period, but Harvard cranked up the offense in the middle stanza pouring 20 shots on goal. They broke the ice midway through the period on Fredric Gregoire’s shot from the right circle and doubled their lead on Jack Badini’s wide open shot at the left post. BU got on the board six minutes into the third period on Patrick Curry’s 10th goal off a Joel Farabee feed with David Farrance also assisting. The Terriers pressed for the equalizer but, with the teams skating four-on-four, Gregoire struck again from the right circle at the 13 minute mark. After BU pulled Purpura, Harvard's Adam Fox scored an empty net goal to give the Crimson a 4-1 lead. With Purpura back in net, Gabriel Chabot converted his own rebound for his first tally of the season, assisted by Mark Cheremeta and Jack DeBoer. Another empty-netter closed out the scoring. Taking the loss, Purpura stopped 34 of 37 shots he faced, and made several sparkling saves in the first two periods. 2021 recruit Jeremy Wilmer scored a goal and added three assists for the North Jersey Avalanche, who fell to Valley Forge in overtime, 6-5. 2020 recruit Devin Kaplan assisted on two Avs' goals. Wilmer leads the AYHL 16Us in scoring with 62 points (27G, 35A). 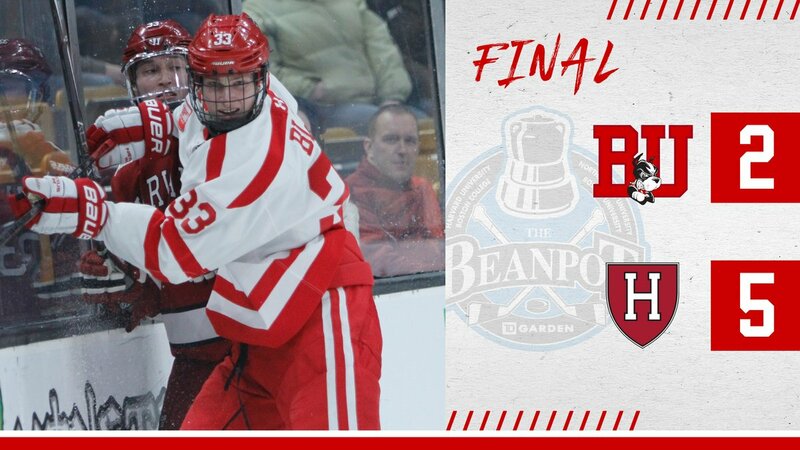 #7 Terriers face off against Harvard in tonight’s Beanpot championship game at the Bright-Landry Hockey Center. Puck drop is at 8 p.m. for the game that will air on NESNplus. For the Terriers, currently on a ten-game, best-in-the-nation unbeaten streak, a win would give them their first ever Beanpot title as a varsity program. BU won the silver pot in 1981 as a club program. Last year, BU defeated the Crimson, 3-2, in the first round of the Beanpot with Jesse Compher producing the game-winner. She leads the Terriers in scoring with 50 points. Sammy Davis is the top goal-scorer with 21. The Terriers have the third-best power play in the country since November 9, clicking at 27.6%, while their penalty kill ranks fourth in the NCAA at 89.0%. Davis earned Hockey East Player of the Week honors after racking up three goals and two assists in the last two games. She had previously won P-O-W in December.